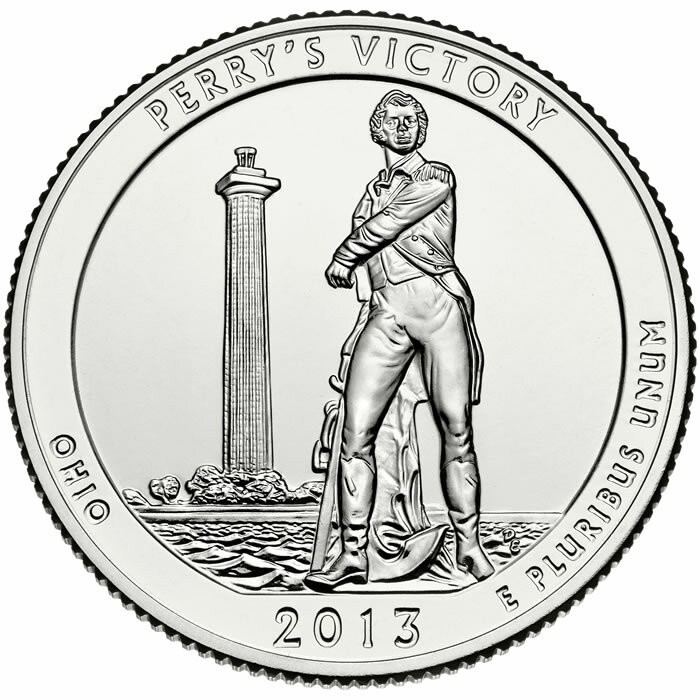 The second 2013 coin in the United States Mint America the Beautiful Quarter® series is the Perry’s Victory and International Peace Memorial Quarter honoring the national site in the state of Ohio. It is the seventeenth quarter overall in the program that launched in 2010 and it was released into circulation beginning on April 1, 2013. On the same day, the United States Mint (www.usmint.gov) started selling bags and rolls of the quarters in circulating quality from U.S. Mint facilities in San Francisco, Denver and Philadelphia. Special proof and uncirculated formats also debut in U.S. Mint products throughout 2013. Several design candidates for the Perry’s Victory and International Peace Quarter were released. The Citizen’s Coinage Advisory Committee and the U.S. Commission of Fine Arts reviewed these designs and forwarded their recommendations to the Secretary of the Treasury. The Treasury Secretary made the final choice for the quarter’s reverse design, along with the other four 2013-dated national park or site quarters designs. 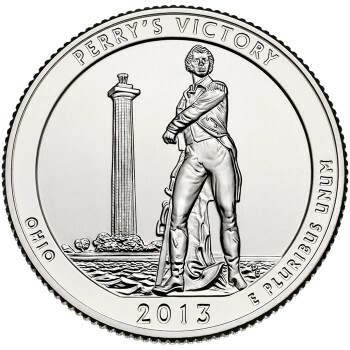 The Perry’s Victory quarter design was both created and executed by Don Everhart. The design features the statue of Master Commandant Oliver Hazard Perry with the Peace Memorial back in the distance. Inscriptions are PERRY’S VICTORY, OHIO, 2013 and E PLURIBUS UNUM. This reverse design is joined by a common obverse of George Washington. The image of the first President of the United States is included on all of the America the Beautiful Quarters and was designed by John Flanagan. These same designs are also featured on two other series of coins from the U.S. Mint, both struck from five ounces of .999 fine silver to a diameter of 3.0 inches. These America the Beautiful Silver Coins are produced in a bullion version as well as an uncirculated collector version. Perry’s Victory and International Peace Memorial of Ohio honors both a historic naval battle as well as the notion of peace. The battle is known as the Battle of Lake Erie and was fought between the United States of America and the British Empire during the War of 1812. Six British ships were captured during the battle by the United States. The memorial was constructed to be a monument to that battle and everlasting peace between Canada, Great Britain and the United States. This memorial is also one of the tallest monuments in the United States. It is a 352 foot Doric column that was constructed with the help of several states from 1912 to 1915. The federal government assumed control of the monument in 1919, and, in 1936, President Franklin D. Roosevelt named it the Perry’s Victory and International Peace Memorial National Monument after Commodore Oliver Hazard Perry who led the U.S. naval forces against the British. In 1972, it was renamed a national memorial.